When I turned sixty-six in August of this year the Social Security Administration sent me a letter offering to send me money every month. All I had to do was apply. I didn't take them up in it, but it did get me thinking about retirement, and, as of September, I have retired .... on Fridays. Nellie, my legal assistant, and I will still practice probate and elder law Monday through Thursday. We will write wills and trusts. We will cause guardians and conservators to be appointed and we will probate wills. 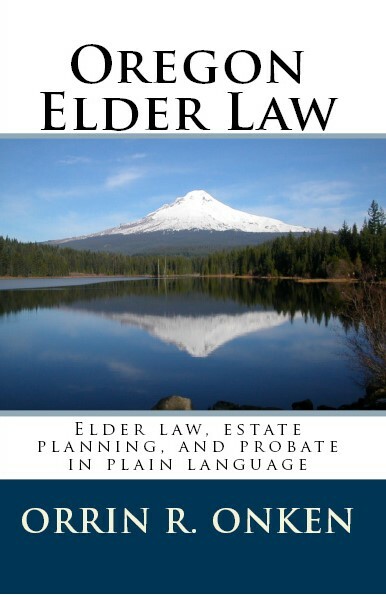 We will even file elder abuse cases and will contests. We will not, however, do any of that on Fridays. I want to remind people that I have been writing this blog for a long time. If you want to find a particular subject you can use the search box on the right or click on the list of labels below the search box. You should be able to find what you want. 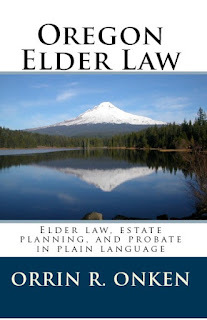 If you want simple explanations of basic estate planning documents you can look at my posts by date and click on the earlier years of this blog for many of those answers. The book is an edited version of my early blog posts and covers all the basics. If you are shy about calling Nellie and having her send you a copy, you can get it on Amazon. If you want to read my other books, which have nothing to do with law, you can get them here and here. If you do want to call in for the book, be sure to do it between Monday and Thursday, because if you call on Friday we won't be there. Repost of "The Anatomy of an Oregon Will"